While politicians debate the merits of legalizing recreational cannabis, many Illinois farmers are more interested in its biological cousin, hemp. Last year, Illinois lawmakers made it legal to grow hemp. Now the race is on for the state to put rules in place in time for the planting season. In this week's Friday Forum, WNIJ's Susan Stephens talks with some of the people pushing to get the hemp industry off the ground. About 200 farmers – veterans and rookies alike -- gathered in Freeport to learn more about the realities of growing industrial hemp. They shuddered at horror stories about Wisconsin farmers who were forced to destroy their entire hemp crop last year because THC levels were too high. A good-natured heckler shouted, “Would crop insurance cover that?” He was met with guffaws. But it’s a legitimate question because last year’s farm bill made hemp eligible for federal crop insurance, for disasters like drought and wildfire. Legalization is moving quickly for the crop that was considered patriotic back in World War II, then ran wild in roadside ditches. But back to THC, the chemical that doomed those Wisconsin plants. It’s the psychoactive compound in cannabis that makes all the difference between an illegal drug and a respectable crop. The cannabis cousins hemp and marijuana are rich in compounds called cannabinoids. THC and CBD are two of those. THC will get you “high.” CBD will not. Hemp has very low levels of THC, so it’s useless as a psychoactive drug -- but it’s great for other uses, like fiber for rope and cloth, and seeds for oil or eating. But bringing back this much-loved/much-maligned leafy green stalk is not going to be easy. 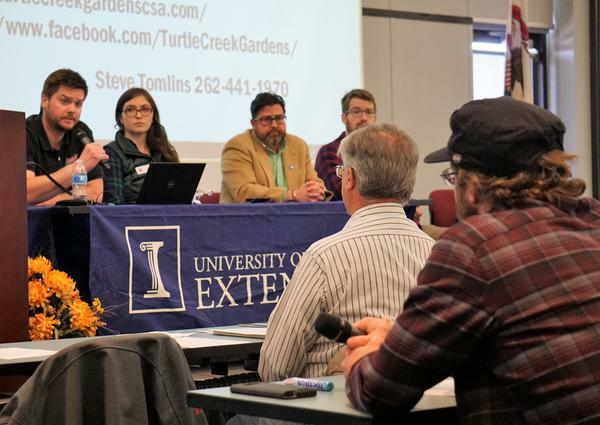 That’s why the University of Illinois Extension stepped in to host an industrial hemp production workshop at Highland Community College in Freeport. Phillip Alberti is Extension’s commercial agriculture educator for Stephenson, Winnebago, and Jo Daviess counties. He says interest is huge among farmers: standard crop prices have been low and markets uncertain. They’ve heard big things about hemp as a money-maker. Alberti says while the future of hemp is exciting, proceed with caution. Another reason to stay calm – you can’t push the process. But you can be ready for it. The Illinois Department of Agriculture released its proposed rules for growing hemp back in December. There was a public comment period, now it’s in a 45-day review period that also includes a hearing by the legislature’s Joint Committee on Administrative Rules, or JCAR. Liz Rupel is confident there will still be time for farmers to plant hemp this season. So what’s in the proposed rules? Specifics could change, but it looks like anyone who wants to grow hemp would have to get a license from the state – plus another license if they want to become a processor. A grower’s license could cost $1000 for three years. Hemp could be grown indoors or out. Anyone with a felony or drug-related misdemeanor within the past five years can’t get a license. And growing operations would be inspected at least once a year – and fined $10,000 if their THC levels are too high. The rules are similar to Wisconsin’s: the state to the north is moving into the second year of a hemp farming pilot program. Phillip Alberti says there are practical lessons to be learned from Wisconsin’s program. Nancy Brannaman says she’s tired of low commodity prices for her soybeans. She lives in Iowa, but her family farm is in LaSalle County. She says she didn’t know much about hemp before the Extension’s workshop. But she learned. She says she didn’t know the three different directions a hemp farmer could go – growing it for grain, for fiber, and the most lucrative hemp product, CBD oil, especially if it’s organic. And Brannaman has another idea to explore: biofuel. She thinks it might be an easier use of hemp than trickier care and processing of plants for CBD oil. Liz Rupel of the Illinois Stewardship Alliance agrees. She says what the industry will need to survive is its own processing, which in turn will keep the profits here in Illinois. She says farmer-led cooperatives will make family farms stronger. The burgeoning industry is a little like the hemp plant itself. So after decades of waiting for the return of a much-hyped super-crop, growers-in-waiting are just going to have to wait a little longer before they can apply for their hemp licenses. So now it’s time to finalize that research: do they want to grow hemp strains for food, fiber, or CBD oil? How many acres? Where will they buy their seed? How much can they afford to gamble? There’s a growing number of groups they can turn to for advice now, including the U of I Extension, the Illinois Hemp Grower’s Association, the Illinois Stewardship Alliance, and the Illinois Farmers Union.